April 8, 2013 – Hell hath no fury like a woman scorned. These days, we may have to update that adage because neither a scorned woman nor the furies of hell have anything on a humiliated national media, a bitter alumna and a network with more power to influence thinking than is healthy. Moments after disgruntled* Auburn graduate Selena Roberts’ posted her latest sad and shameful effort to smear her alma mater, ESPN joined the fray. * Note: Selena, we’re sorry your chaps are still scratchy over the merger of the school of journalism with the communications department, but it’s time for you to stop nursing that grudge. First the self-proclaimed world-wide leader in sports gave Roberts’ shabby effort traction by lauding her poorly-researched efforts as fact. Of course, within a matter of hours, much of what she reported on her disreputable blog was proven to be wrong and/or fabricated, something that is a pattern with Roberts’ reckless journalistic history. Even so, that didn’t stop The Network from presenting her pitiable attempt at writing as a revelation. While ESPN was boosting the credibility of Roberts’ shady, self-serving blog, the network completely ignored a well-researched and potentially damning report from USA Today that linked NCAA president Mark Emmert and Alabama head coach Nick Saban to a variety of transgressions, including a grade-changing scandal and cover-up when both were at LSU. In the immediate aftermath of Roberts’ out-of-nowhere report, ESPN released its own asinine “expose” into the culture of spice (synthetic marijuana) at Auburn. Claiming to present a project that covered six months of dedicated, in-depth research, “The Network” instead provided a laughable, distorted mash of ridiculous speculation, disputable theories, utter falsehoods and baseless allegations. The six months of research ESPN claimed to have put into their report could have been performed equally well in less than 20 minutes by a moderately intelligent orangutan with a keyboard and access to Bing. Except the orangutan would likely have come up with a better result. While it’s tempting to battle the disgraceful ESPN report with a point-by-point rebuttal, that’s already been done, and done very well, by Auburn athletic director Jay Jacobs, who not only flatly refuted most of the report’s allegations but also provided detailed evidence to support his position.This kind of evidentiary support is something in which the ESPN report was sorely lacking. The ESPN report directly took Auburn to task for not punishing students who were engaged in activity that was (a) not at the time illegal in Alabama, (b) was not in violation of NCAA rules, (c) was not against university or team policy and (d) was virtually impossible to test for. It’s interesting to note that during the same timeframe for which ESPN is blasting the Auburn administration, even the US military did not have a policy in place regarding synthetic marijuana, nor did it have a method to accurately test for the substance. According to an article in Stars and Stripes, the US Air Force implemented broader testing in March 2012, but still does not conduct random urine testing for synthetic marijuana. In their article, ESPN selectively ignored the fact that Auburn not only provided direct assistance to a national lab in creating an accurate test for the substance, a test which is now widely used, but Auburn also instituted testing of their student-athletes within three days of that test being made publicly available. When Auburn did and didn’t test for spice isn’t an issue, despite it being framed that way in ESPN’s story. It was sold over the counter in the state of Alabama until October 2011, and the United States government didn’t permanently ban it until July 2012 (the DEA imposed a temporary “emergency” ban in March 2011, after Auburn had already been voluntarily testing for it). You’re reading this right: ESPN expects Auburn University’s football program to field a far more aggressive anti-drug campaign than the DEA’s. In fact, try and find an incident of any school punishing a player for synthetic marijuana before August 2011. The only ones I can find – at any point – are LSU’s Tyrann Mathieu, Tharold Simon and Spencer Ware being suspended for one game in October 2011 and a Kentucky high school quarterback being suspended in November 2011. ESPN’s “breaking story” was actually covered, and covered fairly, back in August 2012 by CBS sports writer Dennis Dodd. Dodd addressed the issue and didn’t resort to distorted sensationalism or a spiteful vendetta to make his point. Would-be journalists, take note. This is how it is done. Selena, take a lesson. If ESPN had wanted to really drive home the astronomical level of drug abuse at Auburn, some sort of “compare and contrast” with the situation at other NCAA institutions would make sense, no? Guess not. While ESPN focused solely on Auburn’s alleged epidemic of synthetic marijuana abuse, the report made no mention of similar problems or positive tests any other schools, or when other schools began testing. So, in case you are wondering, here’s some initial facts to get you started: many NCAA members did not start testing until well after Auburn, and as of this writing, some still don’t yet screen for the substance. This abject failure to perform even the most basic research indicates clear bias and intent. What reason could ESPN and others possibly have to try to damage Auburn’s reputation? The national media did its absolute best to bury Auburn’s dynamic Heisman-winning quarterback Cam Newton in their swirl of dirt. But nothing stuck. And through it all, Newton kept smiling. He kept winning. He smiled all the way to the NFL bank and in the process made almost every talking head on ESPN and every babbling idiot in print look like fools. They wanted to take him down and take Auburn down in the process. They failed. And they failed miserably. Seemed like there should have been a nationwide egg shortage, as everyone from Joe Schad, to Pete Thamel, to Danny Sheridan, to Thayer Evans, to Pat Forde to barrel scraping bloggers like Selena Roberts and Clay Travis wandered around with broken yolks dripping from their collective faces. They didn’t care for that feeling at all. And now those same people are determined to pound the anti-Auburn drum until they finally find something that holds. Forget truth. Forget research. Sling mud on the wall in hopes it will leave a stain. When the Cam Newton hunt crashed and burned and Newton emerged even stronger and brighter than before, those petty hounds turned to chase other phantom rabbits. Auburn pays student workers! Scandal. Outrage. Shut the program down! Jovon Robinson had grades changed! Scandal. Outrage. Shut the program down! Disgruntled former players who failed to realize NFL dreams appear on HBO! Scandal. Outrage. Shut the program down. Bagmen! Scandal. Outrage. Shut the program down! Former players on trial for robbery! Scandal. Outrage. Shut the program down! Spice! Scandal! Outrage. Shut the program down. Doesn’t matter that when the dust settles from all these trumped up scandals, there’s nothing to see. Paper tigers crumble to ash. The narrative has been created. The story has been crafted. Truth? Who needs it? By way of unsupported allegation and wisps of innuendo, the general public must believe Auburn to be the most corrupt organization since Tony Soprano colluded with John Sacramoni. What’s even more galling is that while Auburn has suffered repeated efforts at crucifixion over a flurry of imagined and trumped up transgressions, we’ve watched as what appear to be blatant offenses by the program across the state are swept under the rug with nary a mention nationally. It’s past time to ask why. While a handful of Auburn players may have used spice when it was legal, a former player at the rival institution was arrested for and convicted of selling cocaine in the parking lot of the athletic complex. Where were Pat Forde’s tweets? While Auburn was excoriated by ESPN for not providing drug screening that wasn’t yet available to students who weren’t violating the law, school policy or team rules, that other institution established a clear and persistent pattern of illegal drug use that touched then-current players, players just days from the season’s end and members of the coaching staff. Where was the exhaustive six month investigation into an actual pattern of abuse? Where was the ESPN: The Magazine spread and E:60 video? While one Auburn player allegedly recounts an unverifiable $400 offer from a coach with whom he would have had limited contact (and who worked under a prior head coach), the internet is flooded with photos of athletes from that other institution clearly selling their signatures, representing merchants in personal appearances, consorting with disassociated boosters, partying with NFL agents out of state, advertising for auto customization shops, and giving YouTube testimonials for NCAA banned performance enhancing substances. Documented stories of extra benefits including laptops and fishing trips abound. Where is the outrage? Why isn’t Thayer Evans on the trail? While one Auburn recruit allegedly had his high school transcript altered and was declared ineligible, athletes at the other institution suffer no such sanction for prep grades that were admittedly altered. Where are the cries of scandal? Shouldn’t Outside the Lines be camped out with cameras rolling? 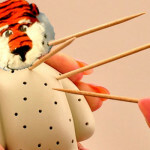 While Auburn was tagged by its own beat reporter for having recruits at a Toomer’s Corner celebration, a misstep which resulted in secondary violations, recruits at the other institution are spirited away from class and hidden in seclusion for weeks at a time by boosters just prior to National Signing Day. Or they vanish from sight and issue statements drafted by others. Where’s the tattling beat writer? Where are the legitimate questions from college football’s governing body? While four ex-Auburn athletes steal from others and suffer the team and societal justice that follows, athletes at the other institution rob students at gunpoint on campus. They brutally assault their girlfriends in public. They are confrontational to law enforcement officers and break windows of police cruisers, without missing a down of football. They fire weapons on crowded public streets. They violently beat and kick fellow students to the point of disfigurement and then rob them. Where is the public furor? Where are the angry charges of a culture of violence? Where is Andrea Kremer and an HBO special about a program out of control? Why hasn’t ESPN developed a 30 for 30 special written by Selena Roberts about corruption and the process of cover up? For all the talk about smoke and fires, we’re all choking on the thick clouds of smoke boiling from places not named Auburn. But in the determined rush to pay Auburn back for making them look so bad, those same folks who should be looking at those ashy clouds are far too busy rubbing their own sticks together hoping against hope that they can manufacture a spark. The Never to Yield Foundation makes no pretense of objectivity. We initiated this rapidly growing movement years ago in response to this same type of vendetta. Tired of seeing our beloved institution smeared by allegations that had no substance, we attempt to shine the light of truth into the darkness of rumor, manufactured reporting and supposition delivered as fact. Our track record isn’t perfect, but we have hit the mark far more often than ESPN or any of the national media. If you doubt us, read through our archives. Here’s what you don’t realize. We know that there are those of you who won’t rest — and we’re looking at you Selena, Clay, Forde and the crimson cabal at ESPN — until you either find something to pin on Auburn or you pass from this earth to whatever awaits you on the other side. We expect you to try and try again. And we will be here, ready and waiting. Every one of these pathetic failed efforts only reinforces what we already knew. We are what we are, we know who we are, we do what we do, and all of those things are far better than most. Fantastic job & very well written might I add. I believe in Auburn & Love It!! Well said, Never to Yield! War Eagle FOREVER! War Eagle!!! So SICK of Auburn being attack and everyone is so quick to believe the lies and throw us under the bus and strip our titles, etc. this would NEVER happen to Bama. They always get the benefit of the doubt. What happened to innocent until proven guilty? Wait a minute… We were PROVEN innocent!!! Now drop it and consider the sources…they are guilty!!! WDE forever!!!! Unfortunately, where there is smoke there is fire. I’ve lived in Auburn my whole life. There is something ratty about the athletics and the time will come when it comes to light. Public opinion of the program has been greatly tarnished with the number of stories in recent years. 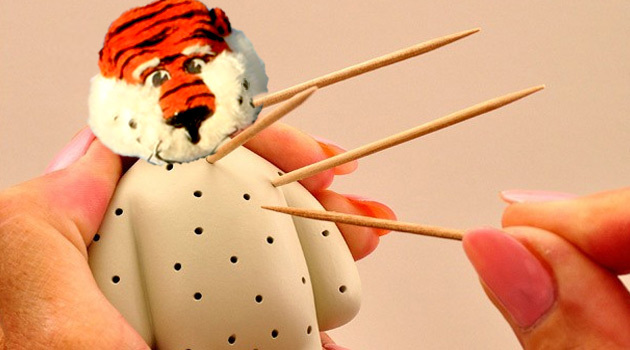 The Tigers may never recover….. Curious why it is necessary to have a website “to promote the positive image of Auburn University”? Most organizations build a reputation based on what they do how they do it without a website to help with a “positive image”. It has always seemed that AU and it’s alumni are struggling to think well of themselves and have others think the same. Can’t figure out if it is a incredible inferiority complex or just paranoia. This article gives me goosebumps. What we are is a family. Families that share something as beautiful as Auburn, will always have to deal with outsiders fearing and loathing that which they can never understand. It is about young Auburn men and Women’s lives. It is about the most beautiful town in the State of Alabama. We are the Auburn Family. I love all of my brothers and sisters. ALL WE HAVE TO FEAR IS FEAR ITS SELF. Have a lovley day, and WAR DAMN EAGLE!!! 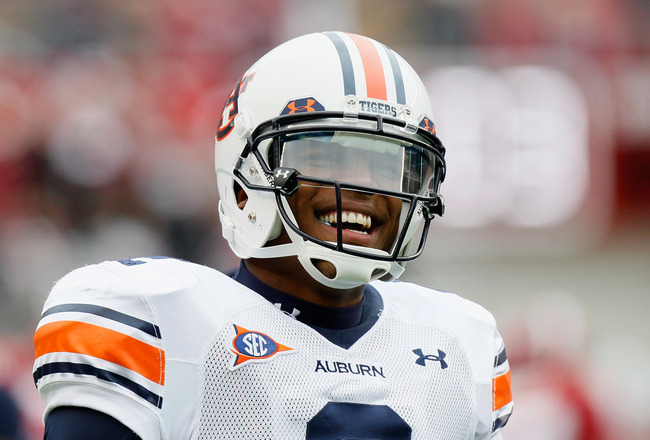 Perception: Auburn paid Mike McNeil to help recruit Dre Kirpatrick to the tune of $500. Truth: Quotes from Dre about that: “Auburn spent little to no money on me during my official visit. We went to a house party that had no cover charge, and had a good time.” “LSU and Alabama both spent a lot more on my visits there than Auburn did.” Since LSU and Alabama both spent A LOT more(and all they could spend was $50), obviously both of the schools violated NCAA rules in his recruitment. See how easy that is to jump to a conclusion that may, or may not be true.Great article and War Eagle!!!! It is wonderful to finally see someone speak up about all the stuff that goes on over in T town. One day, after Sa-tan, I mean Saban’s best friend leaves the NCAA, all of the things they do will be public knowledge. Right now, it will continue to be covered up. I think Selena Roberts is interested in helping Auburn. If you want athletics to improve you need to clean house. Blow it up and start over, especially the AD. I have many friends and relatives that are Auburn fans, and the smart ones know this is needed. Even sadder than the junk in the national fringe media lately is the fact that our Toomer’s oaks will be rolled for the last time. The local newspaper in Auburn, The Auburn Villager, will be “broadcasting” the rolling live, as well as the cutting of the oaks down starting April 23, at its website, http://www.auburnvillager.com. Some times I don’t know what to do. Follow the lead of some of my AU friends and claim everyone cheats including Auburn, or stone wall it and just claim Auburn is innocent and everyone else cheats. I could do like some of you and claim we are innocent and UAT is guilty and everyone is simply so jealous of our 3-9 year that we are the ones getting blamed for their cheating. What is tough, though, is having to blame people like Selena Roberts by bringing up her past (and everyone else who writes bad about us or claims Auburn cheats by bringing up their past), when no one has a past worse than Auburn’s. Who is going to believe me? War…Eagle, fly down the field, Ever to conquer, never to yield. War…Eagle fearless and true. Fight on, you Orange and Blue. Give ‘em hell, give ‘em hell. Bammers ( not Alabama friends,fans,or alumni ) and posers above will never let the truth get in their way of a good Auburn flogging. It’s about time Auburn University stood up on it’s hind legs and fought back. If we take the path of “no comment” and ignoring the attacks, we are weak and guilty. If we speak out, we’re whining, paranoid, and guilty. I’m for speaking out, presenting the facts and letting AU enemies do all the whining like the above examples.